Something I’m SO excited to wear this spring/summer is the long, split skit. Sometimes even with 2 splits!! Im seriously so friggen excited for this trend! Since I actually can’t wait until spring to wear these fab skirts, you can probably see me rocking one with a slouchy sweater tucked in and some awesome heels. 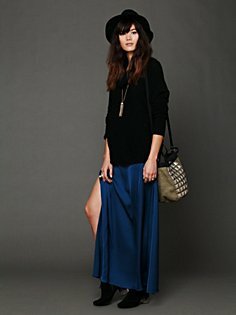 Here are one of my favs from PlantBlue and Free People. Go buy some-seriously!! YUMYUM!!! Ta-ta for now pretties. Posted on January 3, 2013 January 18, 2013 by flancake13	This entry was posted in Obsessions.. Bookmark the permalink. ← Friday I”m in Love. My fav beauty trends for 2013!